If you live in Stockport and are looking for local TV or satellite installation and repair experts, then call The Aerial Guys. We are passionate about providing you with the best possible service. Contact us today on 0161 3272687 to book an appointment. Our friendly and professional engineers will assess your TV aerial’s performance and give you a fixed price, upfront quote there and then – before any work starts. With our extensive network of engineers, working right across the North of England, The Aerial Guys can often ensure an expert engineer visits your Stockport home for an aerial installation or repair that very same day. Call us today on 0161 3272687. We have carried out countless TV aerial installations in Stockport over the years. So, unlike some of the bigger, more anonymous companies, at The Aerial Guys we really do give you a local service that you can rely on. So, whether you need TV aerial repairs in Stockport, or an aerial installation, The Aerial Guys are always on call to come over and sort out your viewing needs. Speak to one of our technical advisers today on0161 3272687 to find out how to arrange a visit from your local Stockport aerial fitters. 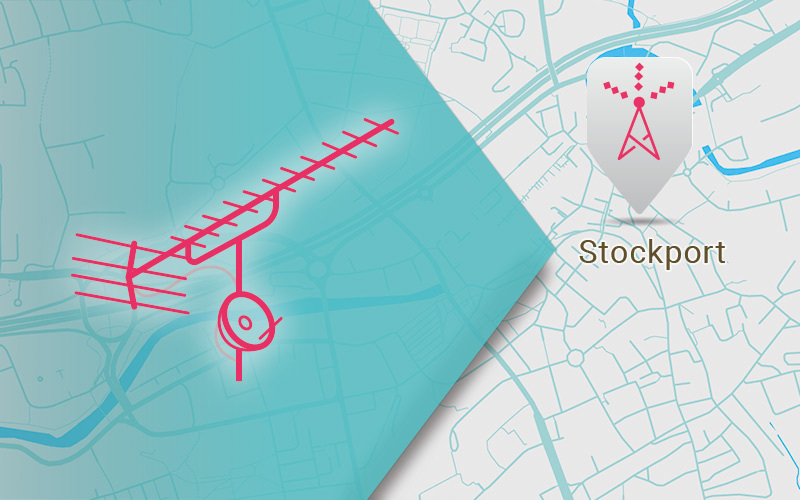 If you require a comprehensive satellite installation in Stockport then look no further. The Aerial Guys can set-up everything – from fitting your satellite dish, to configuring your set-top box and managing any cabling. Here at The Aerial Guys, we are specialists in all the main satellite services, including Sky, Freesat and European satellite installations. Is your satellite signal scrambled or pixelated? The Aerial Guys can carry out full satellite repairs in Stockport and the surrounding area. Our professional engineers always carry a wide range of equipment suitable for all the leading satellite types, which means that we can often fix the problem on the day we arrive. So, if you live in the Stockport area, and need a local satellite repair service, speak to The Aerial Guys today on 0161 3272687. Susan and her sister share a house together. Their TV was getting quite old and recently started to flicker and make odd sounds. The sisters decided it was time to get a new one, as well as setting up a satellite system. But they didn’t know where to start. “I’d resisted having a big system in the house as I thought it might get in the way of our hobbies. But we both like to watch arts and craft programmes so a satellite system was the answer really. You just don’t get that kind of programme on terrestrial TV,” says Susan. “We got the system delivered but we needed someone to help us to put it all together. The Aerial Guys were fabulous. When they arrived, I just let them get on with it. By the time I’d made some tea, the TV was already up and running. And they stayed to show us how the controller worked. They were very helpful and polite – no bother at all. They even told us about their free aftersales helpline service, which gave me that extra peace of mind. We can’t wait to watch the Arts Channel tonight – thanks to The Aerial Guys!” Susan says.